← Man Sees Huge Hovering Craft Emit Beams of Light. Woman Sees 2 Lights in the Sky That Disappeared. Photo Taken. 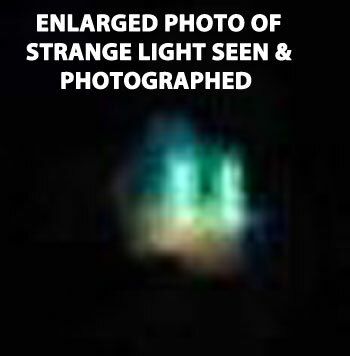 ENLARGED PHOTO OF STRANGE SHAPED OBJECT. Update – February 3, 2016 – Response From Witness Regarding Submission of Additional Photos: So sorry for the late response. I have been very sick with the flu and was recently hospitalized for it. So I looked on your site and you put the green kind of boxy looking UFO up, but not the purple one. I tried to find the original of the purple, but may have accidently erased it. (I was transferring pictures from one laptop to a newer laptop & I think I lost some pictures in the process.) However, with that being said, I do appreciate the comment on your site that said you didn’t think it was a fabricated photo. Yes, I absolutely did crop the picture because I could barely see it. But I never do anything else and I would never send you any hoaxed picture. Your way too smart for that! You have been dealing with this subject for a long time now and I’m quite sure you could pick up the fakes fairly quickly! I was surprised I didn’t see the purple one on your site! To me, the purple was far more interesting than the green one and you also said I sent you two pictures but only one had a picture on it. I didn’t remember sending a second picture.Maybe I did, but I wouldn’t want to send you blank pictures. In searching for my original, I found other UFO pictures I took all in the same month. I have attached several pictures and if you find any you are interested in, I could send in an official report through your site. Many of the pictures are completely unedited, some not even cropped. I am still looking for the original to the purple UFO, but I did find the original of the green one you posted on your site. It is attached along with the other pictures. Note: The photo sent by the witness has been cropped and enlarged. I don’t believe that the sighting has been “fabricated,” but I have requested the original “unedited” photo. The witness saw two lights. Only one light shows up in the photo. This entry was posted in Formation of Lights, Orb-like craft, Orb(s) of Light, Photos, Strange Shaped, UFO Sightings 2015, UFO Sightings Washington. Bookmark the permalink. One Response to Woman Sees 2 Lights in the Sky That Disappeared. Photo Taken. I looked for Iridium flares at Heavens Above, along with ISS passes, for that date & location, but none matched. Possibly a flare from another satellite.